Discussions about Donald Trump and his policies have been dominating our televisions, radios, and newspapers for what seems to be years. Sometimes the noise gets loud, but the reality is the Trump administration’s policies will have real impact on the trucking industry. President Trump has already ordered a freeze on federal regulations. This isn’t uncommon for new presidents, but President Trump has made it clear that he is against the creation of new and potentially burdensome regulations. The new administration is using the freeze as an opportunity to allow department heads, appointed by Trump, to review all of these pending regulations and make sure they have merit. What does this mean for the trucking industry? Don’t expect any new changes any time soon, as this review process could take a while and may result in some regulations being scrapped. While new and pending regulations were officially halted on January 20, it appears that the new administration is also serious about reducing the number of existing regulations. In the, “A Message from President-Elect Donald J. Trump” video from the 2017 Transition YouTube site, Trump claimed, “I will formulate a rule which says that for every one new regulation, two old regulations must be eliminated.” He has since followed through with that promise by signing an executive order that requires just that. 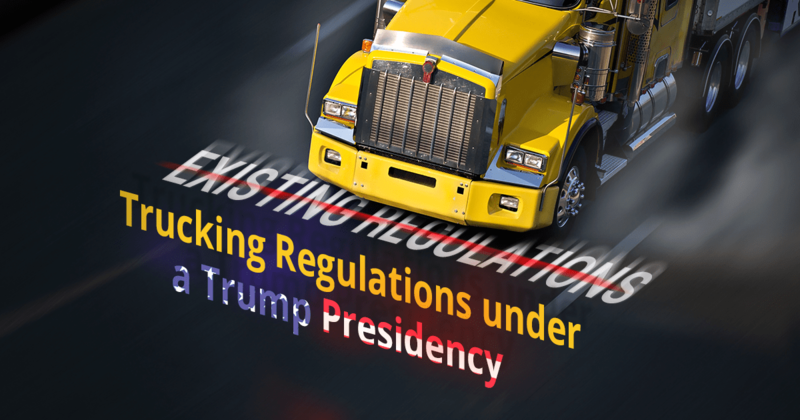 The Department of Transportation and Environmental Protection Agency could see the most regulatory cuts that would directly affect truckers and the trucking industry. President Trump has made some major promises about infrastructure. During his victory speech he claimed, “We’re going to rebuild our infrastructure, which will become, by the way, second to none.” He specifically mentioned highways, bridges, and tunnels during that portion of the speech. For truckers, that means more goods to be hauled and more construction zones to be navigated, with the hope of future trips taking less time on safer and less congested roadways. It certainly sounds like there could be a great deal of good news ahead for truckers and trucking companies. Improved roads, reduced regulations, and a stronger economy all sound wonderful, but the truth is a lot remains to be seen and nothing in government happens smoothly or quickly. Congress will have its own ideas on how to proceed and there is sure to be some conflict there. Significant change is certainly possible, but for now all we can do is pay close attention to potential changes and make our voices heard so these changes have a positive impact on our industry. While government officials iron all this out, truckers will still be there maintaining the supply chains that keep this country running. Everyone should agree with that. Hunter Tires sells quality bus tires and semi tires.